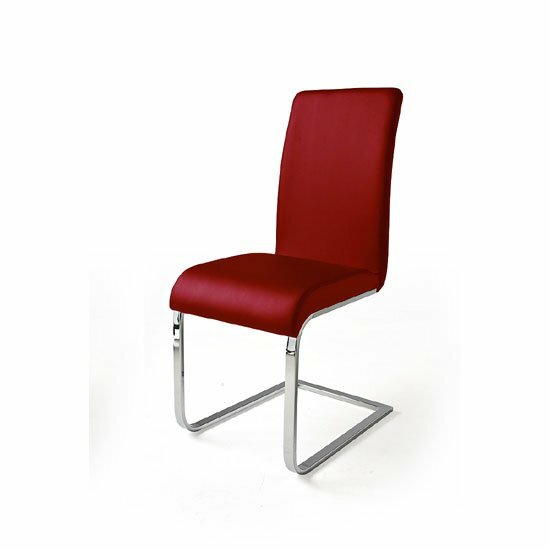 Even the simplest dining chairs with metal legs will look very impressive with a clear glass table. Metal legs next to a clear glass table will give any dining area a very sleek, modern look. And, if you would like to create an even more impressive atmosphere in your dining room, go for a tinted glass table and choose a contrasting chair shade. A lot of dining chairs with metal legs come with wooden seats — and even more of them are made of MDF in wood effect. This kind of chairs is perfect for those working on a traditional dining room interior and trying to stay on a budget. If you prefer soft chairs to firm ones, think of going with really bright, colourful chair upholstery. It will not work with a wooden table, but it will look great next to clear glass or high gloss one. If you choose the latter option, choose a classic colour, like white or black. This is a perfect example of contrast that will never go out of style. Leather upholstery is another example of dining chairs with metal legs that look great practically with any table material. Dark leather in combination with wooden table will give the dining room a dignified, traditional look. If you go with light glossy tables, choose in favour of light leather shades. And, of course, pastel beige leather upholstery will look amazing with any dining table, giving the room a classic, neutral look. Another idea you might want to give some thought to is to try an unusual base design. Usually, these models will cost a little more than chairs on classic four legs. Still, if you are looking for something that can give your dining room a designer look, these are the surest models to consider. It is also possible to find some glossy chairs. They will look very impressive next to matching high gloss dining tables, as well as clear glass models. If you go with high gloss table, you can either choose a matching chair shade or work on contrasting table and chair colours. Finally, note that you are not supposed to choose just one chair type. Mix matching shapes and colours is an amazing idea that will give your room a sweet, homey look. However, you will need at least a six-seater table for that. And, if you mix match chairs, go for at least a pair of each type.